For the base I used one of my frankens. It's this gray & blue with small silver-blue shimmer. I used acrylic paint for everything else. For the for the red blood I put some to the places I wanted, but it looked too neat, so I used my pinky to smear it and make it look more zombie-like. Same thing with the green. I feel zombies are little greenish in the face. 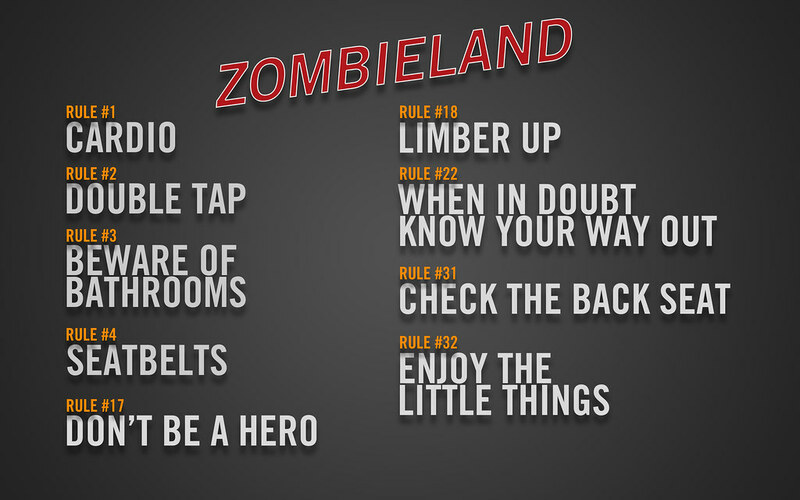 And in the case of an actual Zombie Apocalypse, I recommend all of you to follow the 32 rules of Zombieland. They seem pretty efficient. you did a great job looks so cool and scary! Great job, perfect for Halloween! awesome job! :) like it! Man these are creepy looking! Very nice! Oh wow! These turned out great! Love them. Glad you're feeling better. Those nails are sick! woooowww i love thats colour of your nails. wonderful nail art!!! love love love it... enjoyed your blog.. following you now.. hope you could visit my blog too.. kissess!!!! This is so cool! I just saw the new episode of Walking Dead last night. It was sooo good. Your zombie inspired nails are so awesome!